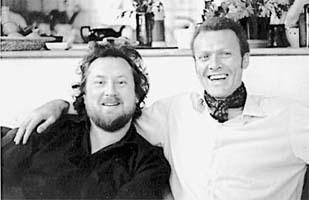 The immense impact Davy Graham had on the guitarists emerging form the British folk scene in the early days has long been acknowledged and is fairly well documented. Back in the sixties he was so far ahead of just about any would-be picker that it was practically miraculous. I can't think of any of my contemporaries from those days who weren't completely knocked over by his playing, and we all owe him a huge debt. If it wasn't for Davy I'd still be working in the kitchens, had I'd been lucky enough to last that long. Although the focus of attention has usually been on his approach to the finger style steel-string guitar, it seems to me that his whole music approach has been influential. It is his ideas; his no-barriers open thinking that has been so telling in creating a direction for the folk movement in general. And it is interesting, thinking back to those rather hideout days, that the ideas of an outsider - for that is surely what he was relative to the traditionalist camps - have come to have far more ongoing potency than the dictatorial policy of the time. Davy was always too free a spirit to be confined to the purist camp, and maybe it is a mistake even to talk about him in those terms. Nevertheless his work certainly opened up a range of new directions at a time when British revivalists were just beginning to get heard through the domestic records companies. There is no doubt that it was his thinking and playing that set the cat amongst the pigeons, causing an upheaval whose reverberations are still rolling. In the staid atmosphere of the British revival in the early sixties Davy's ideas were almost overwhelming. They kept coming in fast and clear from all angles. What is more as far as I can see, he has never stopped, never chosen to take a well earned rest as the grand old doyen, but kept on keeping on. No doubt partly due to the mysteries of the music-biz machinery something that seems specifically designed to baffle most musicians - Davy's recorded output has been a little uneven. Yet there has been a fairly regular flow of recordings. Most are hard to find and some are real rarities, so it was good news when Rollercoaster stepped in with a program to re-release some of what has hitherto been available, plus other previously unissued live material recorded away from the studio. "After Hours" - recorded at a party in the mid-sixties and Rollercoaster's first release in a series of Davy Graham issues - is a gem, which stands on a par with Decca's early groundbreaking "Folk Blues And Beyond". Excellent though much of the studio work was, it was the live environment that really encouraged Davy to stretch out. Many of us who sat at his feet in the clubs still recall a lot happening in his playing that didn't get on to the early commercial recordings. The wonderful variety in his choice of material for example; pieces of any origin, from virtually any period, style or country - the way in which musical parallels would be drawn between seemingly diverse pieces (fusion, I suppose) and, in particular, solos that veered off at a tangent and only wound their way back after extended explorations. Davy when he was really blowing. Well, "After Hours" captures much of that, and for me it's been an affirmation. I've played it over and over and it offers up new wonders every time. It would be good to think that there may be more unofficial recordings out there that will come to light. I first heard about Davy in '63, while sitting around with other similarly disposed types, one of whom actually owned a guitar. He was already of part of a myth even then. My friends spoke in awe about how they had seen him and heard him play - a mysterious figure who, having passed through, left behind a legacy of stumbling guitar patterns. I can still clearly remember the transparency of that D held against an A minor chord in "Anji". And like others, it put a focus on the music I wanted to play as well. I suppose, as on the directions of my life was to take. Davy's influence extended beyond the guitar playing and into life style. A close second to the music in our esteem was the fact that he was a traveling man who had made the fabled journey down to Tangiers when the rest of us still had our sights set on Brighton pier. That certainly back in the early days, but even then his name was spreading on the grapevine some time before the first recordings appeared. It was a bit later, probably in the mid-sixties, that I actually got to hear him play. It was in a place called the Wooden Bridge in Guildford and he was sitting in with John Mayall. By that stage the old Dixieland fad and the Skiffle craze had somehow merged into British R&B, which was running more or less on the parallel to the folk music. Most of the bands were guitar heavy and the spotlight was usually on the soloist. Davy was playing a round hole Gibson fitted with a de-Armond pickup. He looked suitable cool with a semi-Afro hairstyle and a single earring, and his playing was right in there. The opinion of some players has been that he had too strong a personality to fit comfortably into a band setting, but I don't believe that's true. On his recordings he often worked with small combos to great effects and that night he played sympathetic and very guitaristic backing patterns in sixths and tenths rather than adhering to the emerging fashion of searing lead lines. 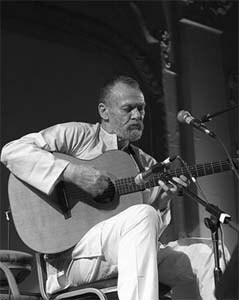 It was much the same approach that he brought to the accompaniment of folk-blues, which has been such an influence on the British acoustic guitar style. It seemed that it was the R&B scene that appreciated Davy's playing initially and presented him with a platform. It was Alexis Korner, whose band Blues Incorporated held down the coveted Wednesday night at the Marquee, who singled Davy out and organized his first record "3/4 AD" for Topic in 1962. And it was that record that really opened the floodgates on the guitar front. The EP contained not only the authenticated version of "Anji"(at that time spelled "Angi") but highlighted Davy as lead man in the duo, playing double-string choruses in contrast to the single-line work. "3/4 AD" was what a generation of players caught between Skiffle and R&B had been waiting for, It's almost impossible to describe the effect of that one little record. Equally completing in its own way was Davy's collaboration with Shirley Collins the following year; "Folk Routes And New Routes", his second album for Decca. The pairing of the rose of the folk movement with a musician, who probably didn't possess an Aran sweater, let alone a tin beer mug, was greeted with cries of heresy from within traditionalist ranks. Up until then, the big dilemma in traditionalist circles had been how (if at all) the old songs should be accompanied. Many, in fact, were deemed unaccompaniable, and even for those that weren't - the steel-string guitar, still smelling strongly of Skiffle - was regarded as simply beyond the pale. However, it was Davy's innovative accompaniments that shows other players a way forward in the arrangement of British traditional material, leading directly to other convincing solutions. And it was as a direct result of the collaboration that the break took place in the folk movement, the separate developments of which have continued to the present. 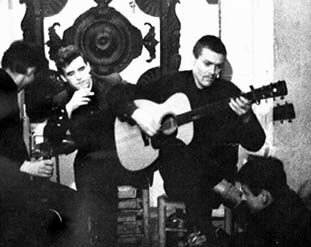 But, although Davy's accompaniments for Shirley Collins set a precedent, if I had to single out one piece as a turning point it would be the arrangement of "She Moved Through The Fair" In 1964, Davy was recorded live at Troubadour in Earls Court, shortly after he had got back from Tangiers. In North Africa, he had come up with a new tuning more compatible with the music of the oud - DADGAD. He exploited the potential of the tuning to explore the modal characteristics of the old Irish air; the arrangement unfolding from a slow beginning and then draw out and danced with, only to be put back gently and reverently in place. It still stands as an exceptional piece, both in playing and conception and, at the time, it was absolutely stunning. If Davy had done little else except become the inventor of DADGAD, his immorality would still be assured. It quickly became virtually the standard tuning for the accompaniment of traditional material, and has spawned a host of variants - altered tuning of the types which have lead to a distinct branch of contemporary finger style playing, culminating in the work of such players as Pierre Bensusan, Alex de Grassi and Michael Hedges - players who have taken the steel string guitar into wonderful new areas while being lumped together under the New Age banner, a welcome development clearly traceable back in concept to Davy's early guitar work. In keeping with the times, his own initial guitar influences would have been the American folk and blues men, some of whom played in Europe in the late fifties and sixties - Broonzy, Josh White, Brownie McGee and Jessie Fuller, for example. But it's difficult to think of many other players who took their influences and blended them in such a creative way. The only guitarist who springs to mind is Sandy Bull, whose early Vanguard recordings provide fascinating comparison with the direction Davy was taking. But, as far as I know, the two were working independently along similar lines - a curious case of parallel development. But, even if Davy's original source was the American tradition, the compliment has long since been repaid. Paul Simon listened closely to Davy in London before returning to the States to make his first recordings - among which was his first version of "Anji". And, back in '68 when the Pentangle first went over to tour, I remember hearing a track on underground radio by Buffalo Springfield, the precursors of Crosby, Stills and Nash. The tune was "Bluebird" in which the central feature - an extended guitar solo by Steve Stills - turned out to be virtually a note-for-note recreation of Davy's "She Moved Through The Fair". To try and trace the extent of Davy's influence would be a daunting task, which would fill a hefty tome. But this collection gives a fair indication of the breadth of his ideas. Although no one records could ever do him justice.